When used as part of a regular haircare regime, Organic Cedar Atlas Essential Oil helps to control dandruff and keeps the hair in great condition, and in recent research it was found to treat hair loss. A blend of rosemary and cedar atlas oils added to a fragrance-free shampoo and conditioner base will give tired, lifeless hair a welcome boost. 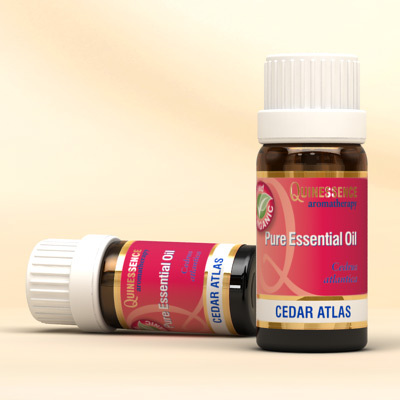 Organic Cedar Atlas Essential Oil has a strong antiseptic and astringent action that can be used to great effect in skincare treatments for a wide range of common conditions such as acne and spots. Whilst it does not offer the same potency as tea tree, it does present a more acceptable aroma for many people! It is an excellent inhalant oil for clearing stubborn catarrh and for easing all types of respiratory conditions. Nineteen (44%) of 43 patients in the active group showed improvement compared with 6 (15%) of 41 patients in the control group (P = .008). An alopecia scale was applied by blinded observers on sequential photographs and was shown to be reproducible with good interobserver agreement (kappa = 0.84). The degree of improvement on photographic assessment was significant (P = .05). Demographic analysis showed that the 2 groups were well matched for prognostic factors. The conclusion to this research was that treatment with these essential oils was significantly more effective than treatment with just the carrier oil alone (P = .008 for the primary outcome measure). They also claimed they had successfully applied an evidence-based method to an alternative therapy.